MR Online | Who Profits from the Occupation? Last February saw the launch of the Web site “Who Profits?” (URL: <WhoProfits.org>). The Web site presents an extensive list of Israeli and multinational corporations that are financially involved in the Israeli occupation of Palestinian territories, whether by the funding of businesses in illegal settlements or by the supply of services, as well as military and construction equipment, to the system of occupation in the West Bank and Gaza. The site interface includes a search engine which allows searches by the company name, its country of origin, and even by its annual income and the stock index in which it is traded. Among the dozens of companies which are listed on the site, it is hard not to notice the names of the leading companies in the Israeli economy, such as the Alon Group, Africa-Israel Investments, Elbit Systems Ltd, and the major banks, as well as some prominent weapons manufacturers and hi-tech companies. Not all companies in the list are known actors in the military-industrial complex: some of the occupation profiteers include Caterpillar, which provides the equipment for house demolitions as well as construction of checkpoints; Hewlett Packard (HP), which provides the Israeli military with information and communication technology; and even Pizza Hut and General Mills, the producer of Pillsbury, which are dealing heavily with illegal settlements. The site would be highly valuable for activists who aim at the boycott of businesses investing in the system of Israeli occupation and for public campaigns against the illegal settlements in Palestinian lands. The Web site is maintained by the Israeli movement Coalition of Women for Peace. The movement conducts, besides operating the Web site, a wide range of activities against the Israeli occupation of Palestine and against all sorts of social and economic inequalities which exist in Israel. During the last assault on Gaza, known inside Israel as “Operation Cast Lead,” the coalition has conducted a series of demonstrations against the acts of the Israeli military, as well as against the use of force on both sides (the Coalition’s report on the actions against the war is available for download here). I have conducted a short interview with the Coalition’s project coordinator Dalit Baum, about WhoProfits.org and the Coalition in general. First, what can you tell us about Coalition of Women for Peace, its composition, and its history? The Coalition of Women for Peace is a feminist peace organization, comprised of Jewish and Palestinian citizens of Israel. The organization serves also as a coalition of 10 different feminist organizations; each specializes in its own forms of action and analysis in the Israeli-Palestinian conflict. For example: Women in Black, who have held weekly vigils against the occupation throughout Israel for the last 22 years; Bat Shalom, which promotes an alternative peace negotiation and joint work with Palestinian women’s organizations; Bat Tzafon, which works for civil equality within Israel; Checkpoint Watch, whose members serve as human rights observers at military checkpoints throughout the occupied West Bank; New Profile, which works toward a de-militarization of Israeli society and promotes alternative education and support of conscientious objectors. 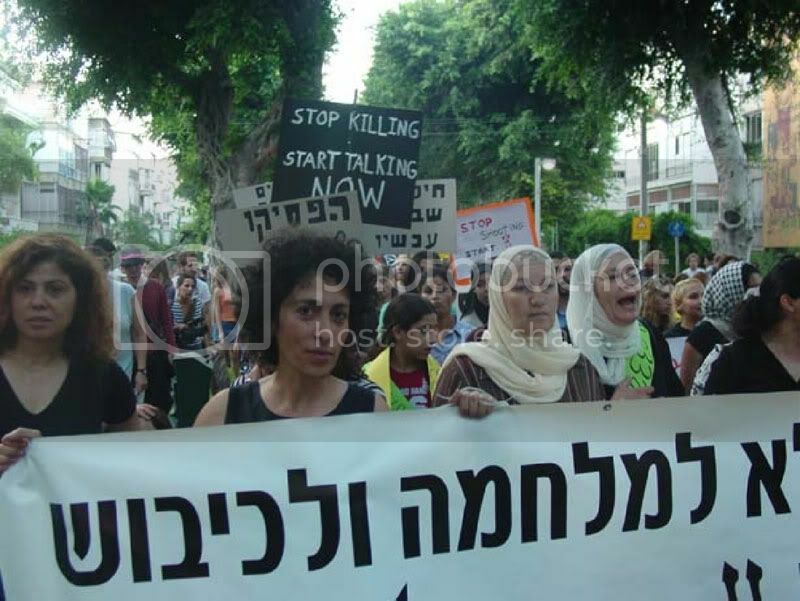 The Women’s Coalition was founded in November 2000, after the outbreak of the Second Intifada, and today it is a leading voice in the Israeli anti-occupation movement. The Coalition is committed to the struggle to end the occupation; to the full involvement of women in peace negotiations; to an end to the excessive militarization of Israeli society; to equality, inclusion, and justice for Palestinian citizens of Israel; to equality and social justice for all residents of Israel. The Coalition of Women for Peace is a non-hierarchical organization, managed by its monthly forum which is open to all women. The monthly forum discusses activities and projects and reaches decisions by consensus. Women from the Coalition’s member organizations participate in the same forum. The monthly forum also nominates ad-hoc committees which are responsible for developing and conducting activities. The Coalition has a board which is responsible for overall administration and works with committees such as the finance committee, the controller committee, etc. What are the main methods of action taken by the Coalition and how does it coordinate its activities with other organizations? In addition to supporting the work of its member organizations, the Coalition carries out its own actions — mass rallies, campaigns, and educational activity. It runs outreach and advocacy programs within Israeli society and activities which involve solidarity and cooperation with Palestinian women in the occupied territories. The coalition has served as a rallying power in bringing together various other Israeli organizations and groups in protest and resistance to the last war in Lebanon, the on-going siege of Gaza, and the latest Israeli attacks on Gaza. It has also coordinated international solidarity actions through the international Women in Black network and other feminist peace movements around the world. As many of the Coalition’s publications argue, on much of the social issues which plague Israeli society and politics, there also exists a specific feminist perspective. Could you give some examples of this perspective? As feminist citizens of Israel, we strive to end the state of war Israel has always been in, since a militarist society is a society that marginalizes all life concerns, and that includes human security and wellbeing, which are the traditional concerns of women. We also strive to live in a democracy, with equal rights to all residents, women and men, Jewish and Palestinian, of all ethnicities. We view the military occupation regime as an atrocity and a crime against basic humanity, which corrupts Israeli society, destroys democracy, and creates a military hegemony which is sexist, misogynist, and violent. It is of course essential to note that all social issues everywhere are gendered and deserve a feminist perspective. The site WhoProfits.org is probably the most comprehensive database examining the connection between big business and the Israeli system of occupation. How did you manage to undertake such an extensive project? Our database offers a first-ever mapping of the corporate aspects of and interests in the continued occupation; it includes a new useful categorization of all corporate interests in the occupation and exposes specific examples of direct involvement of many international and Israeli companies for the first time. In tracing ownership links, it shows in detail how some of Israel’s largest corporations are tied in with the occupation. The Web site includes presently only a fraction of our research results. This on-line resource already lists about 200 companies, and hundreds more will be added during 2009. The reason why this process is time-consuming is because we try and authenticate every piece of information and document it. The work on the database has been going on for almost two years now, mostly by a team of activists and observers from different organizations in the coalition. Our presence on the ground, in-site visits, and observation tours to all industrial zones have proven invaluable. Our freedom of movement, as Israeli citizens in the occupied territories, our understanding of the language and the codes, our access to official documents, these are all assets to the international movement who cares to influence the occupation industry. Where would you place the Coalition’s stand on the subject of the global campaign of BDS (Boycott, Divestment, Sanctions) against the occupation, and how do you see the Web site integrating with such a campaign? In this database, we provide information and draw attention to the various sorts of corporate interests that help maintain the Israeli occupation, through specific examples. Our first goal is to stimulate a candid public debate about the costs and benefits of the occupation among different parts of Israeli society and how these interests influence political decision-making in Israel and globally. We are also active as an information center, answering queries from all around the world about specific involvements or companies. We also conduct specific research focusing on various aspects of the occupation — like the exploitation of nonrenewable Palestinian natural resources, or the involvement of banks, etc. We are obligated to try and educate ourselves and others about the economic incentives and corporate involvement in the occupation, but this is, of course, not enough. We try and serve as a central focal point of information for various campaigns, bringing together all the information collected so far, verifying it ourselves, and then publishing it on our Web site. We wish to help the creation of an effective global movement, using this service. We do not call for any one specific form of action towards all the companies in our database, since different methods and strategies are appropriate for different conditions and locations. We feel that the creation of this information center is our response, as a major Israeli peace organization, to the 2005 Palestinian civil society call for BDS. We plan to continue to support and encourage diverse methods to influence corporations to stop their involvement in the occupation, and thus help create an effective global movement to end the occupation. Daniel Rosenberg is an Israeli student, education worker, and activist for peace and social justice.